Calling all carless students! I’ve lived without a car in San Diego for almost three years now, and I know the struggle of wanting off-campus food but not having any way to get there. Maybe you’ve contacted friends that have cars and they’re all busy, or maybe you don’t feel like dropping money on an Uber. The next best option would be to take a bus, but where can the bus even take you? Technically, you could take the bus all the way to downtown San Diego if you wanted, but that would take hours. For this list, I’ll take efficiency into account and will be sticking exclusively to places that you can get to in 30 minutes or less. I hope the places on this list satisfy your food cravings and show that you don’t have to go too far to get a great meal. Happy bussing! Conveniently located at Westfield UTC, this is one of my go-to spots that’s close to campus for fresh, healthy, feel-good food. Each “plate” order comes with a protein, a salad, and a carb; my favorite combination is the seared tuna, baby spinach salad (with goat cheese and hazelnuts!) and creamy mashed potatoes. The salmon is also a flavorful option if you don’t like things rare, and the mint lemonade and agua frescas get honorable mention. I’ve been to a lot of poke places, and this one has to be the best bang for your buck. 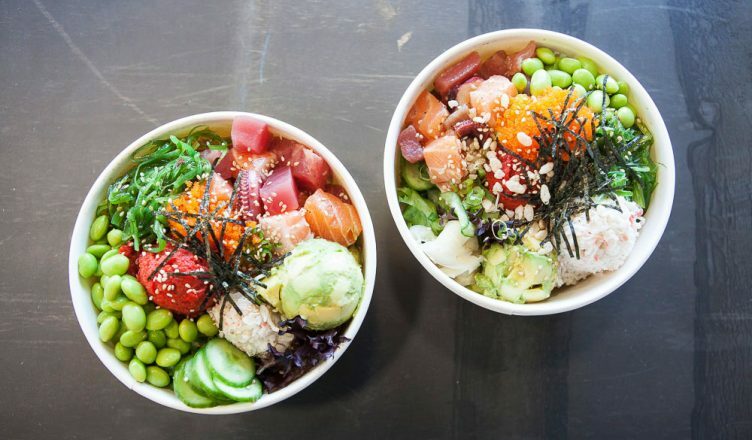 The small bowl, which is around $10, only comes with two scoops of fish, but don’t let that fool you — the base and heaping portions of add-ons and toppings will fill you up quickly. The fish is always fresh, the workers are always helpful, and the biggest plus of all: avocado isn’t an extra charge. Pro tip: Their name is true; simply ask for one-and-a-half portions of the add-ons and toppings if you feel like an extra helping! Oscar’s usually has a line out the door, but there’s a reason: their seafood tacos are amazing. At around $5 a piece, the tacos are a bit on the expensive end, but I usually balance this out by getting one Surf and Turf taco, which has skirt steak and shrimp, and a battered fish taco, which is slightly more reasonable at $2.25. For a different taste, try their ceviche, or if you get here early enough, they offer a smoked fish burrito for only $5.50. Their Pacific Beach location is just a few blocks from the beach, so you can take your food and enjoy some ocean views. After exploring San Diego’s historic Old Town, head to Cafe Coyote for some great Mexican food. The first time I ate here, I remember being initially overwhelmed because their menu is huge — they serve everything from sopas to tamales to tacos to burritos. For those who are over 21, they also have plenty of colorful margaritas to choose from. For a take-home snack, stop by the front to pick up a bag of wonderfully sugary and cinnamon-y bunuelos. 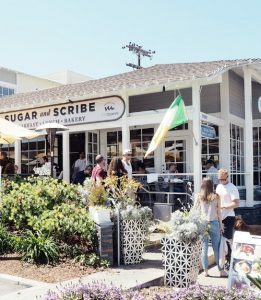 While La Jolla is known for its brunch, Sugar and Scribe takes it up a notch with creations like The Smothered and Covered Skillet with scrambled eggs, bacon, and gravy over roasted potatoes, Beef and Guinness Pie with a flaky puff pastry top, and, my personal favorite, Lemon Curd Pancakes with orange cardamom syrup. Coffee is from the local Dark Horse Coffee Roasters, and if you’re not hungry enough for a full meal, head inside to the bakery to check out their selection of fresh breads and pastries instead. Owner Chef Maeve Rochford has been featured on The Food Network a few times, so this is definitely worth checking out for your next morning outing. Right at the Encinitas Station for the Coaster and a few busses is the Encinitas Cafe. Rumor has it that this was one of the Beach Boys favorite restaurants back when it was the Coffee Mill.